This was our first real experience of Mike Jessop’s Oceancraft design, build and general philosophy, and to say it was eye-opening, could be the understatement of the decade. The dory, such a little thing in real terms it lived in the cockpit of Far-Away, was inch by inch the most seaworthy, safest and most stable 2.8 m deep-vee fishing dory (or ‘tinny’ if you will) we have ever known – before or since. Indeed, we practically lived in the 2.8m Oceancraft when we were up north, as Far-Away was the mothership, anchored securely, and blissfully free of scales, fish gunk – and their associated smells. 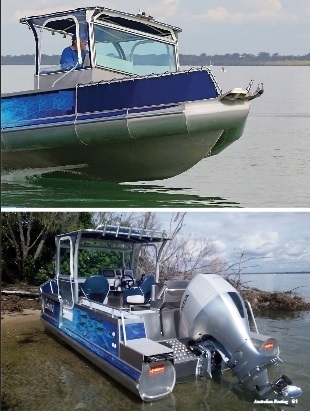 Interestingly, although it has just become a trendy new development, we were running the dory’s Minn Kota trolling motor wholly off its special solar power panel (over the Honda outboard) back then. 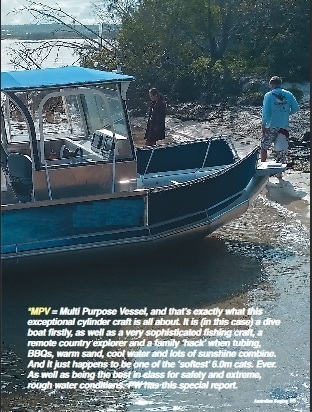 buyers who have purchased Oceancraft for remote expedition adventures, and again, shared the satisfaction and enthusiasm these owners have had for his Oceancraft. 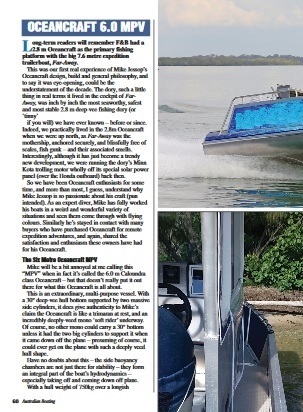 Mike will be a bit annoyed at me calling this “MPV when in fact it’s called the 6.0 m Caloundra Class Oceancraft but that doesn’t really put it out there for what this Oceancraft is all about. This is an extraordinary, multi-purpose vessel. With a 30° deep-vee hull bottom supported by two massive side cylinders, it does give authenticity to Mike’s claim the Oceancraft is like a trimaran at rest, and an incredibly deeply-veed mono ‘soft rider’ underway. Of course, no other mono could carry a 30° bottom unless it had the two big cylinders to support it when it came down off the plane – presuming of course, it could ever get on the plane with such a deeply veed hull shape. Have no doubts about this the side buoyancy chambers are not just there for stability they form an integral part of the boat’s hydrodynamics especially taking off and coming down off plane. 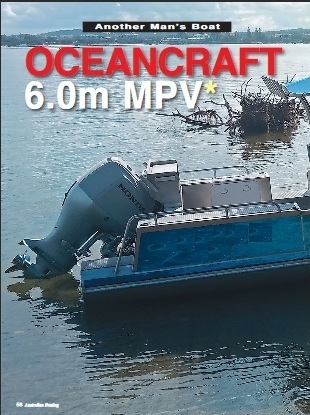 waterline length, and cylinder buoyancy when taking off or carrying a load, the Oceancraft planes easily, and runs very efficiently in terms of power especially so considering the hull shape. But make no mistake about this; the Oceancraft is not an experimental rig by any means. 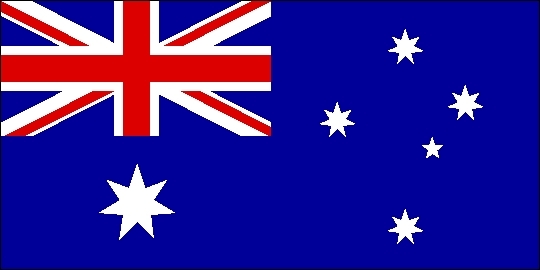 Hundreds of cylinder craft have now been built by several manufacturers in Australia and New Zealand. The results are in, and in this case, Mike Jessop has the runs on the board and a better understanding of how these craft work than almost anybody else on the planet. 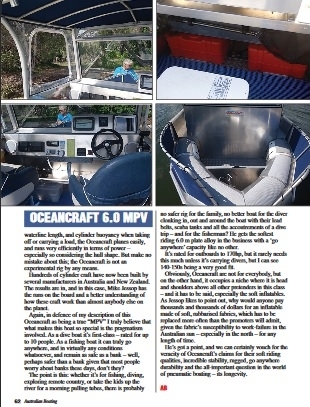 Again, in defence of my description of this Oceancraft as being a true "MPV" I truly believe that what makes this boat so special is the pragmatism involved. 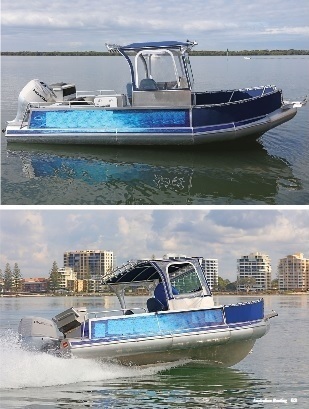 As a dive boat it's first-class – rated for up to 10 people. 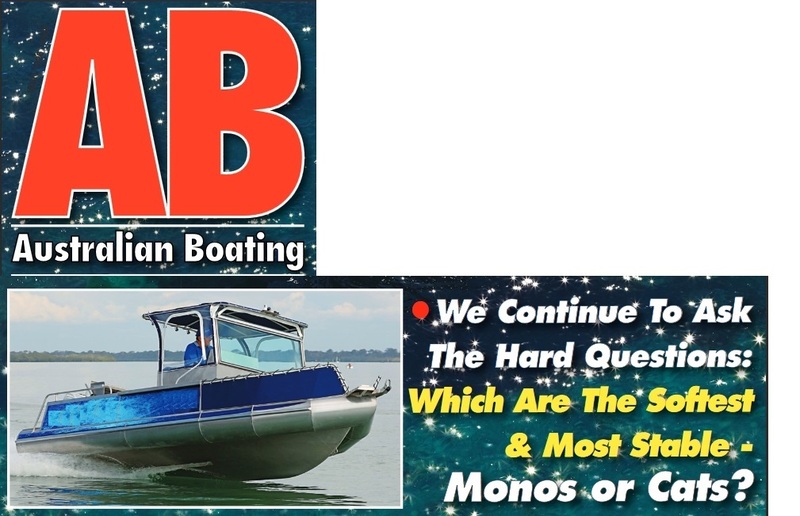 As a fishing boat it can truly go anywhere, and in virtually any conditions whatsoever, and remain as safe as a bank – well, perhaps safer than a bank given that most people worry about banks these days, don't they? no safer rig for the family, no better boat for the diver clonking in, out and around the boat with their lead belts, scuba tanks and all the accoutrements of a dive trip and for the fisherman? He gets the softest riding 6.0 m plate alloy in the business with a 'go anywhere' capacity like no other. It's rated for outboards to 170hp, but it rarely needs this much unless it's carrying divers, but I can see 140-150s being a very good fit. Obviously, Oceancraft are not for everybody, but on the other hand, it occupies a niche where it is head and shoulders above all other pretenders in this class and it has to be said, especially the soft inflatables. As Jessop likes to point out, why would anyone pay thousands and thousands of dollars for an inflatable made of soft, rubberised fabrics, which has to be replaced more often than the promoters will admit, given the fabric's susceptibility to work-failure in the Australian sun especially in the north for any length of time. 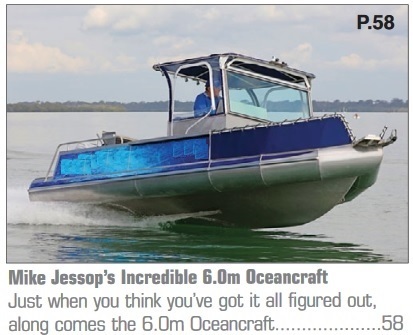 He's got a point, and we can certainly vouch for the veracity of Oceancraft's claims for their soft riding qualities, incredible stability, rugged, go anywhere durability and the all-important question in the world of pneumatic boating is its longevity.